After several years in research and development, Rival Gaming launched their casino suite in 2006. They have a very simple philosophy – to build games that people love to play and provide the services and support to bring those games to market effectively. This they have certainly achieved, evidenced by the fact that they are the casino suite of choice for over forty online casino operators worldwide. Rival Gaming is committed to meeting high standards in customer service, fair play, and operator accountability and supports responsible gaming in all the jurisdictions Rival operate in. There are two types of games on offer at Rival Gaming – American and European Roulette. The American game has two zeros and the European game has just one zero. This means that the house edge on the European Game is smaller, 2.7% compared to the 5.26% for the American Game. Both games feature a large betting area and the wheel in the top left-hand corner of the screen. Options at the table include changing the speed between medium and slow and having the game on full screen or not. You’ll also be able to set background sound volume. Above the betting area, you’ll see the betting limits for the table, which will include both inside and outside bets. Clicking on the spin history tab will expand this section and you’ll see a run-down of the previous results from the wheel. Placing a bet is simply a case of clicking on the appropriate chip amount and then clicking again where you want the chip placed. The selections will be highlighted when hovering over the betting area – for example, if the mouse pointer is positioned over the “black” betting selection, all of the black numbers will be highlighted. Having placed a bet you’ll be able to remove it by either clicking on the appropriate button or hitting the “minus” key on the keyboard. Having hit spin, you’ll see the ball set in motion – when the ball lands in a slot you’ll see a large close up of this part of the wheel. It’s not particularly easy to follow a certain number on the wheel, so the close-up at the end is a great addition to the game. One of the big advantages of Rival Gaming is that you’ll be able to play games for real money or just for fun, simply by registering at one of the casino sites. Playing for fun gives you the opportunity to test a game before investing your hard earned cash – an option that is not open to all online casino players. Rival Gaming has a wide range of great casino games. There are twenty-one iSlots, featuring Episodes One, Two and Three of “As the Reels Turn”. There are also twenty-one 3 reel slots, including Fantastic Fruit and Global Soccer. 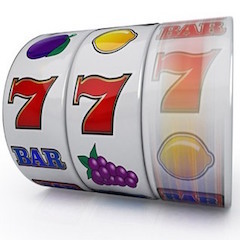 The largest offering of slots is the games featuring 5 reels, with 66 different slots available. These include the featured games of Lion’s Roar, Astral Luck, and Blazin’ Buffalo. You’ll also be able to win big at Rival Gaming with their progressive Jackpot games – Major Moolah, Money Magic, One Million Reels BC and Strike Gold. The table games available include several varieties of Blackjack and Baccarat, Let It Ride, Pai Gow, Red Dog and War and you’ll be able to enjoy fourteen different versions of video poker. As well as these standard games, the specialty games you can play at Rival Gaming include Bingo, Keno, Sudoku and Scratch Cards. Ruby Royal Casino is a site that makes great use of the Rival Gaming software. When entering the site you are given the choice of downloading the software or playing on the browser, and then you’ll choose to play for real money or for fun. When first playing at Ruby Royal you’ll be offered 888 free bets to use in 30 minutes, where you’ll be able to earn a bonus of $100 – depositing just $25 will move this amount into your account. Having taken advantage of this bonus, you can also sign up to a 300% welcome bonus, up to $3,000 for players of slots and table games. The bonuses do not stop there! You can also claim a variety of different bonuses on a weekly bonus, based upon either slots or table games –slots players can claim an amazing 380% weekly bonus when depositing $400 or more. Welcome a friend aboard and you can even earn yourself an extra bonus of $50. Rival Gaming and Ruby Royal Casino make a great team, with the outstanding bonuses on offer complementing the casino games suite supplied – even better, you’ll be able to play from the US!